Five years old on Earth Day 2018, the Bullitt Center is surpassing its lofty environmental goals, as well as meeting its commercial objectives. “The Bullitt Center is proof that profitable, zero energy Living Buildings are possible,” said Denis Hayes, CEO of the Bullitt Foundation, which owns the Bullitt Centre. “To meet the goals of the Paris Climate Agreement, all buildings need to do the same,” he added. The building is 100% leased with a diverse mix of tenants that include Sonos, Intentional Futures, PAE Consulting Engineers, University of Washington’s Center for Integrated Design, International Living Future Institute, and Hammer & Hand. Seattle City Light buys energy the building does not use (“negawatt-hours”) for a total of approximately $50,000 each year. This is rebated to tenants who meet their energy goals as an incentive for energy efficiency. Seattle Mayor Durkan expanded this pilot to 30 buildings on April 11, 2018. More than 25,000 people have toured the building, including the largest residential real estate developer in the world, the President of Bulgaria, Mayor of Copenhagen, U.S. Secretary of Energy, EPA Administrator, U.S. Senators and Governors, along with thousands of architects, engineers and builders. A growing list of projects cite the Bullitt Center as an influence, including the Obama Presidential Library, Kendeda Building for Innovative Sustainable Design at Georgia Tech, Rocky Mountain Institute headquarters, American Geophysical Union building, Santa Monica City Hall, and the Mosaic Centre. Business leaders have visited to learn about the building from companies that include Costco, Etsy, Google, Microsoft, REI, and Starbucks. Of course, the Bullitt Center has also surpassed lofty expectations for environmental performance, generating 20 percent more energy than it used every year since it opened, using only one-third as much energy as a well-run LEED Platinum building, and using 95 percent less water (1 gallon per square foot per year) than the average office building in Seattle, despite having showers on every floor. The University of Washington, State of Washington, King County, City of Seattle, Skanska USA, Starbucks, Amazon, Microsoft, and REI, among 2,500 others, all signed a statement committing to the goals of the Paris Climate Agreement. Despite the success of the Bullitt Center, the vast majority of new construction does no better than meet the bare bones requirements of building code. A 52,000 square-foot commercial building at the intersection of Capitol Hill and the Central Area in Seattle, the Bullitt Center is designed, built and operated to be the world’s greenest office building. Owned by the Bullitt Foundation, the building is a market-rate, Class-A commercial office building with 90 percent of its space leased to commercial enterprises. It was developed to show what’s possible today and to demonstrate a path forward for other real estate development projects. For more information visit http://www.bullittcenter.org. This entry was posted in comment and tagged Bullitt Centre, Denis Hayes, Living Building Challenge, Paris Climate Agreement on April 25, 2018 by martin brown. Advocacy or activism. Advocacy has become a common descriptor for many sustainability folk, and one I’ve used for many years. Maybe now is the time for the activist description to become as popular as the advocate, moving from advocating for change to doing and driving change. Activist: a person who campaigns for some kind of social change. Each chapter, written by a respected expert in the field, covers essential principles as well as best practices is accompanied by a hands-on case study that demonstrates the principles in action. There are many contributors those in sustainability will be very familiar with for example Bill McKibben (350.org) and Annie Leonard (Story of Stuff) and those in the built environment sustainability space will recognise Denis Hayes, the driver behind the Bullitt Centre, the worlds greenest commercial building. I was particular interested to see Wade Davis, author of Into the Silence, a 2012 Boardman Tasker award shortlist, included here. Patagonia hopes the book will be dog-eared and scribbled in and always at hand, an insightful resource and reliable companion to the environmental movement, I am sure it will be. This entry was posted in book review, comment and tagged activism, activist, advocacy, advocate, book review, Bullitt Centre, change, Denis Hayes, Patagonia, sustainability, Tools, Wade Davis on August 8, 2016 by martin brown. Updated: Ready for a Circular Economy? This blog has mentioned and covered concepts of Circular Economy, Cradle to Cradle and related themes on many occasions, including the 2008 Constructing Excellence Lancashire Waste is Stupid event and presentation for that asked the question when did the construction Take Make Dump become acceptable, and why it remains so. Whilst we see an increase in interest and a hunger to understand, an occasional interface with mainstream sustainability (as represented by BREEAM) and with BIM (GreenBIM), circular economy thinking struggles to gain any real traction within the built environment. Research shows that the circular economy could be worth up to £29billion to the UK economy. It remains unclear how much of this would be construction related, but is this another area we can apply the rule of thumb 40% factor to, making a significant impact on the sector? The Living Building Challenge provides a great framework for circular economy thinking, requiring for example, Conservation Plans not just Site Waste Management Plans, and pulls on the DfD (Design for Disassembly or Design for Deconstruction) principles as a guide for material selection and management within Living Building Challenge projects. And it is DfD principles that will form the core of my talk at the Green Vision circular economy with examples from recent visits in the UK, Europe, Canada and the US. Circular Economy and DfD principles present great opportunities and challenges for todays design and construction within the world of BIM. 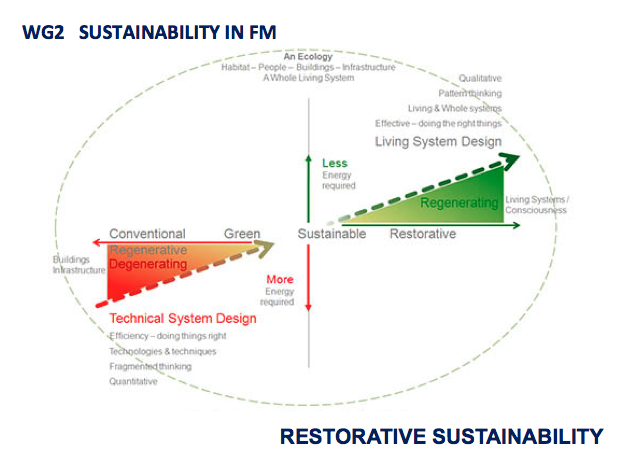 Can we for example design buildings with materials and components that have a secondary designed life after the first? and, how can we incorporate materials and components that are already insitu within existing buildings? The Alliander company ‘new’ HQ building in the Netherlands demonstrates it is possible, using concepts such as Material Passports to incorporate 80% raw materials from existing buildings and have designed re-use potential for 80% of the new building. However, if we are serious in designing and constructing buildings with circular economy thinking, with a planned lifetimes reaching to 250 years, as for example in the case of Bullitt Centre, is it acceptable or responsible to specify or include unhealthy or toxic chemicals or materials? We would be potentially locking risks into many years of use and potentially many future buildings. A good place to start is to ensure the buildings are LBC Red List compliant. The Bullitt Centre has demonstrated toxic material free buildings are possible in six-storey, city centre commercial buildings. The era of just harm reduction should really be history, and, in an age of responsible construction, the Precautionary Principle (to do no harm where evidence of health or ecological risk exists), should be forefront in design. And if unhealthy or toxic materials are really unavoidable, then project Deconstruction Plan’s must detail the designed replacement rationale and methodology as soon as healthy alternatives become available. Circular thinking and DFD are explored within my upcoming RIBA publication FutuRestorative as inspirations and challenges for a new sustainability in the built environment. This entry was posted in built environment, sustainability and tagged BuildWell2016, Bullitt Centre, circular economy, construction, cradle to cradle, design, dfd, fairsnape, FutuREstorative, Green Vision, GVis2016, Living Building Challenge, sustainability on February 7, 2016 by martin brown.